Saudi Arabia is a desert country encompassing most of the Arabian Peninsula, with Red Sea and Persian (Arabian) Gulf coastlines. Known as the birthplace of Islam, it’s home to the religion’s 2 most sacred mosques: Masjid al-Haram, in Mecca, destination of the annual Hajj pilgrimage, and Medina’s Masjid an-Nabawi, burial site of the prophet Muhammad. Riyadh, the capital, is a skyscraper-filled metropolis. 1. 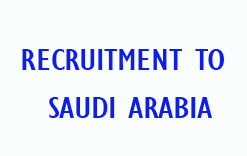 SR. Contract Engineer (Bachelor Degree/Diploma in Mechanical with Minimum 7 Years experience, as a contracts engineer / administration in construction & maintenance project of Oil & Gas. 2. Project Control Engineer (Degree/Diploma in Mechanical with minimum 5 years experience of project control in construction & maintenance project of oil & gas petro chemical. 3. Estimator (Electrical & Instrument) – Degree/Diploma in E&l with 7 years experience in the field of estimation of electrical & instrumentation works in oil and gas & petrochemical. 4.Estimator (Mechanical Construction) – Degree / Diploma in mechanical with minimum 5 years experience in the field of estimation in construction or maintenance refinery, oil and gas & petrochemical. 5. Estimator (Chemical Cleaning) – Degree/Diploma in chemical with minimum 5 years experience in the field of operators/production/process/precommissioning of chemical and petrochemical.